Destiny 2 was officially unveiled this week, proving the GameStop release date leak to be true. 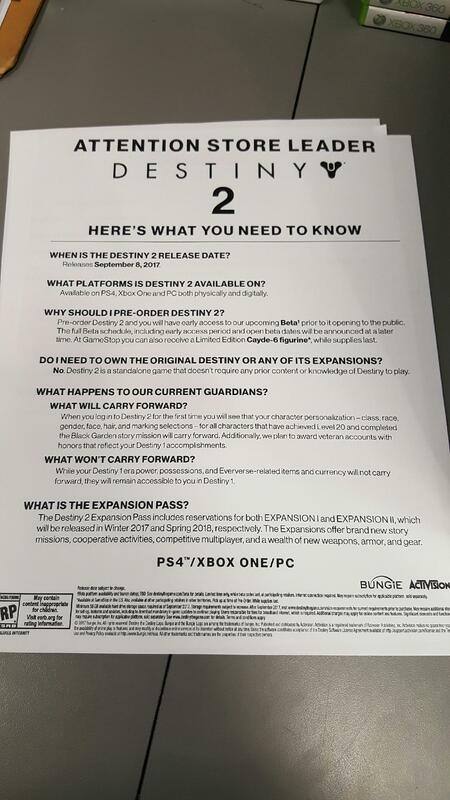 A few hours ago, another GameStop employee shared on the Web two documents sent by Bungie and Activision to inform the retailer about the game. They both contain interesting information, starting with Destiny 2’s schedule for the first two expansions, due in Winter 2017 and Spring 2018. When is the Destiny 2 Release Date? What Platforms is Destiny 2 available on? Available on PS4, Xbox One & PC both physically and digitally. Why should I pre-order Destiny 2? Pre-order Destiny 2 and you will have early access to our upcoming Beta* prior to it being open to the public. The full beta schedule, including early access prior and open beta dates will be announced at a later time. At GameStop you can also receive a Limited edition Cayde-6 Figurine*, while supplies last. Do I need to own the Original Destiny or any of its expansions? No. Destiny 2 is a standalone game that doesn’t require any prior content or knowledge of Destiny to play. 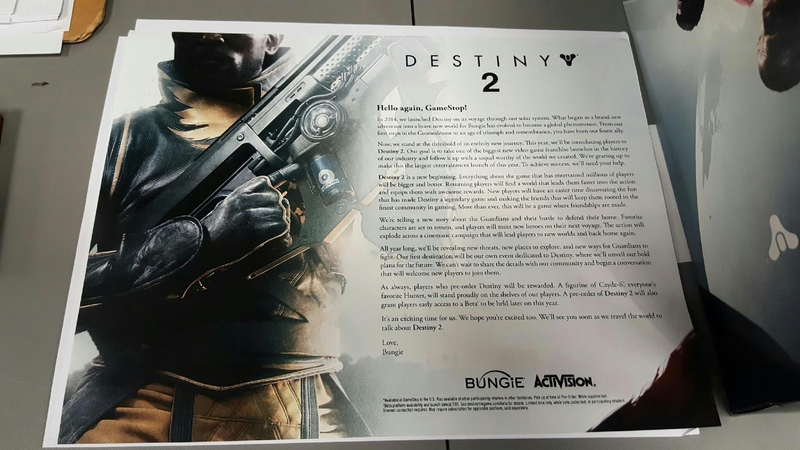 The other document provides tidbits on Bungie’s plans for this sequel, including an event solely dedicated to Destiny (similar to what other companies do with their big franchises). What would you like to see in Destiny 2? Tell us in the comments!